Japanese culture has always been close to our family. My husband was born in Tokyo; his Irish-American parents had settled in the mountains outside the city after the Vietnam War. Though they returned to the United States when he was four, my in-laws have maintained a deep love for all things Japanese and their home is still elegantly decorated with oriental fabrics, paintings, and ceramics. My husband, who once spoke Japanese, no longer remembers the language but still loves the food; even now, our family’s celebratory meal for each child’s birth is tonkatsu–a breaded, deep-fried pork tenderloin with raw cabbage and rice. Our first dog was even Japanese: the intelligent and lively Shiba Inu, bred by the Japanese to hunt small game. It’s been interesting to move to Alaska, too, which has a continuous stream of Japanese tourists who cross the Pacific in droves each winter to see the northern lights. Like Hachiko, Satoko’s story is well-known by most Japanese. She was born into a wealthy family in Tokyo in 1929. Sheltered and so refined that her own friends called her “the princess,” Satoko embraced ancient Japanese religious and cultural traditions and proudly traced her ancestry back a thousand years to Bushido Warrior and Shinto priesthood. This brings me to perhaps the most compelling aspect of The Smile of a Ragpicker: Fr. Glynn’s ability to truly immerse you in Japanese culture. He painstakingly explains Bushido (“Way of the Warrior”), a code of conduct based on the samurai class, in which the values of frugality, loyalty, and honor unto death are paramount. In the mid-1800s, Bushido extended beyond samurai to all of Japanese society; its emphasis on absolute loyalty to the feudal lord contributed greatly to the rise of Japanese nationalism prior to World War II. Father Glynn also explains how the ancient religions of Buddhism and Shintoism have infused Japanese culture with a keen sensitivity to beauty. Like G.K. Chesterton and Mother Teresa, Fr. Glynn clearly recognizes the goodness that God has gifted into the eastern religions for the sake of his Japanese children, even as he asserts the fullness of truth in our Catholic faith. As a young woman, Satoko had passionately embraced Bushido, and unquestioningly supported Japan’s military decisions during the war. She even trained with a spear to fight off Allied invaders at just 13, and later quit school to work in an airplane factory. When the war ended, however, Satoko and most other Japanese experienced profound disillusionment as the crimes and atrocities committed by the Japanese military were revealed to be anything but honorable. Father Glynn captures the citizens’ sense of disillusionment and despair so poignantly; you deeply sense what it must have been like for the Japanese people to look around at their ruined country and realize that their deepest values had been betrayed by their leaders. Many lost the will to live and suicide was rampant. It’s with this backdrop that Fr. Glynn finally introduces you to Satoko, who made a conscious decision to reject the pessimism and despair so prevalent among her countrymen after WWII. Her sensitivity to beauty and attraction to purity instead led her to Catholicism. One thing I love about The Smile of a Ragpicker is how Fr. Glynn uses Satoko’s correspondence to trace the evolution of her spirituality. She goes from a somewhat vain, self-centered young woman to a living saint, but the emotional and spiritual struggles she experienced in giving up her self-love and worldliness are detailed and to me, so inspiring. Father Glynn ensures that we see this young woman in all her imperfect humanity so that we can relate to her; Satoko is no distant, holier-than-thou saint, but a passionate young woman who must cooperate with God in the painful and lengthy process of sanctification. The message, of course, being that if she can do it, so can we. The second half of the book chronicles the story of Ants Town, a commune of homeless scrap collectors (“ragpickers”) who eventually drew Satoko out of the security of her parents’ luxurious home and into a ramshackle hut with them to share their plight. Though Glynn does take some time to set up the story properly, it’s this information that truly makes the story sing as he describes the last few years of Satoko’s life and her profound impact on the ragpicker community and eventually, on the entire nation of Japan. Though I knew the heroine was going to die young (Glynn references it several times), I still found myself anxious to find out how the story was going to end–and regretful that the book was done when I turned the last page. 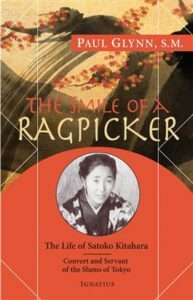 Though not exactly light reading, The Smile of a Ragpicker is definitely worth the time you spend getting to know both Satoko and our Japanese brothers and sisters.